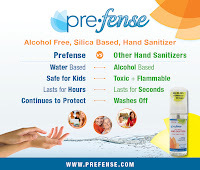 I'm so excited to have the opportunity to try out Prefense Foaming Hand Sanitizer. With three kids in school, keeping germs at bay is a priority around here. I admit I was a bit skeptical when I first heard about this product, but I've been pleasantly surprised by it. I didn't think anything could last through hand washings, but reading through their online information, I've been convinced. I like to use this on the kids if we are heading to museums or other hands-on places. Then they are protected--and so am I. I think you'll be pleasantly surprised by the way it helps moisturize your hands when you use it. I've been putting this in my car so we have it available when we are out and about. I've been working at a consignment sale and I use this before going in to handle all those hangars and toys and items brought in by the moms. While I know the literature says one pump lasts all day, I admit to using it when I leave even though I don't have to. I think that's the hardest part of using this versus alcohol-based sanitizers. I have trouble not reapplying all day long. It's been a pleasant change of pace. I used it at a kid party as well. It was nice to be able to put on their hands and then let them eat their food without worrying about them ingesting the alcohol-based sanitizer. No alcohol! Prefense is made of all-natural ingredients and has absolutely NO alcohol in it! Our technology protects you for 24 hours or 10 hand washings! 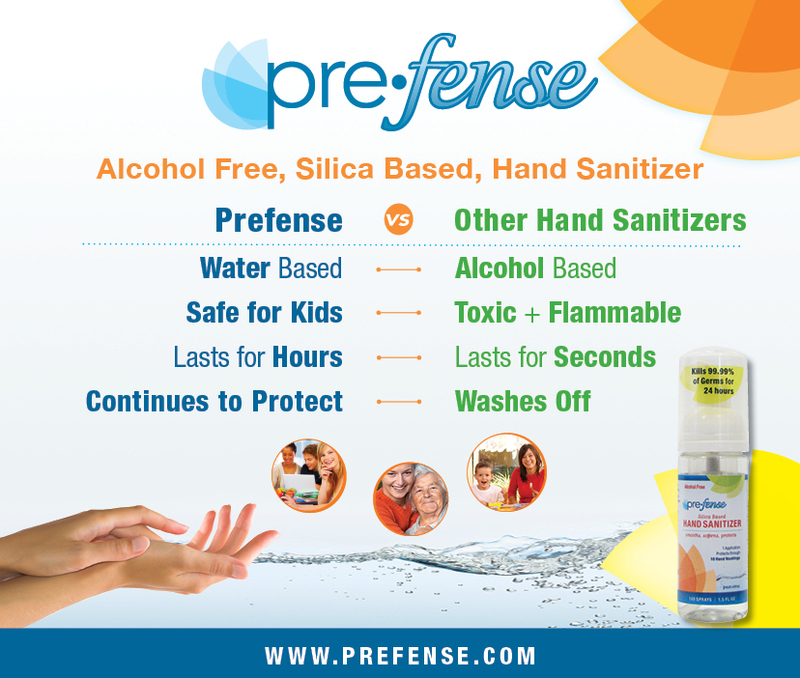 Prefense is silica based which means it doesn't dry out your hands like traditional alcohol sanitizers. It actually smooths and softens your hands. 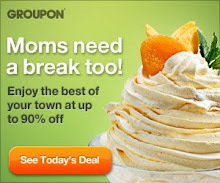 You can totally see this when you apply it! 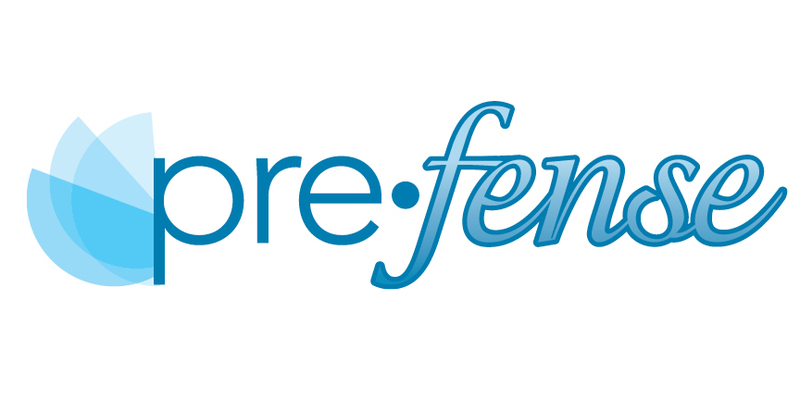 Prefense protects against staph, strep, E.coli, drug resistant MRSA strains, and more. We fight germs that other hand sanitizers can't. Because "one spray lasts all day" our 1.5 oz Prefense Foaming Hand Sanitizer offers 120 applications, costing only $0.08 per day, compared to $1.20 per day with alcohol hand sanitizers. You can purchase at a discount through the Prefense Website. Or you can purchase through Amazon to get super saver shipping. Would you like to win a 1.5 oz. Prefense Foaming Hand Sanitizer? Comment on one thing you like about Prefense from my review above. • Open to addresses in the United States. I like that it's non-toxic and safe for kids. I like that is is not toxic...that is good for everyone. I like that it lasts all day.